Play free Lisa and Bandit Online games. You control Lisa and Bandit by using the arrow keys: left, right, up and down, and with the space bar. The right arrow key increases speed and the left decreases speed. You have full stop and two speeds: walk and gallop. To jump, you have to be galloping, and to duck you have to be walking. Here's how it works: Jump = Gallop + space bar Duck = Walk + arrow down Good luck on your adventure! Lisa and Bandit are best friends. They've decided to take a long, refreshing ride in the great outdoors. Lisa is an experienced rider and Bandit is a fantastic jumper. 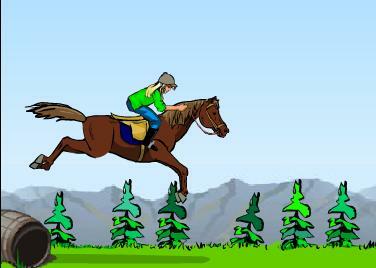 Can you guide them safely through all the outdoor obstacles?